CollectingMagic.co.uk: Maskelyne's Mysteries as a Brand. Maskelyne's Mysteries as a Brand. From the 1860s the Maskelyne family presented magic entertainments in London and on tour around the world. There was a gradual decline in the Maskelyne's fortunes however and their last theatre closed between the wars. The decision was made in 1935 to sell the company and Lewis Davenport, who performed at the Maskelynes' entertainments throughout his career, purchased Maskelyne's Mysteries. The deed for this purchase was (and probably still is) on display at The British Magic Museum. The deed is pictured below, apologies for the awkward angle, it was to avoid reflections off the case. With the purchase came a huge amount of paperwork, apparatus and theatrical equipment. It also came with the rights to use the Maskelyne name and this article is going to look at how Davenports used the name to sell their wares. As a side note the Davenports did occasionally perform using the Maskelyne's Mysteries banner, but I'm going to concentrate on the shop side here. "Maskelyne's Mysteries" was a phrase used by the Maskelynes for many years to describe their performances. The Davenports stuck with this and the term "Maskelyne's Mysteries" was used alongside "Demon Series" to represent tricks retailed by Davenports. 1930s and 1940s catalogues usually had "L. Davenport and Co. and Maskelyne's Mysteries" as the header on every pair of pages. In August 1935 Davenports opened a satellite shop, also in London, called Maskelyne's Mysteries (ran by Gus Davenport). This was open a relatively short time, closing in April of the following year (dates can be found in this pdf from The Davenport Collection website). Although it was only open a brief time catalogues were issued. Following the closure the Maskelyne's Mysteries name was still used on leaflets and catalogues such as the one below. Although the Maskelyne's Mysteries name was used prominently across Davenports catalogues and adverts it was only rarely used on specific lines sold by the company. One example, possibly the first, is this woodworking plan for an effect known as The Phantom Air Mail. It prominently states "Maskelyne's Mysteries present The Magical Constructor No.1". As far as I know there were never any further Magical Constructor plans, I have seen four or five of this particular plan, but none for other effects. It seems like a really good idea, so I'm not sure why these plans weren't more popular. Maybe magicians weren't willing to pay for an effect in plan form, I haven't seen any examples of this trick made up. The most successful Maskelyne branding was Davenport's range of toy magic sets. Davenports had always made sets, but the Maskelyne's Mysteries sets were extremely popular and can be found much more easily than other Davenports sets. These sets have similarities with others of the period, particularly the Ernest Sewell sets discussed in this post. I believe the Maskelyne's Mysteries sets were first manufactured around the same time as the first Sewell ones in the late 1930s. They were often sold by department stores and independent retailers. Below is the most commonly found size of set, coincidentally, my three examples were all retailed by Gamages (shown in the bottom right corner of each label). The contents varies between sets, sometimes items listed on the inside of the box are blanked out and replaced by other tricks with their own loose instructions. Tricks included varied from imported mass produced items to items made by the Davenports themselves (sometimes by the children). 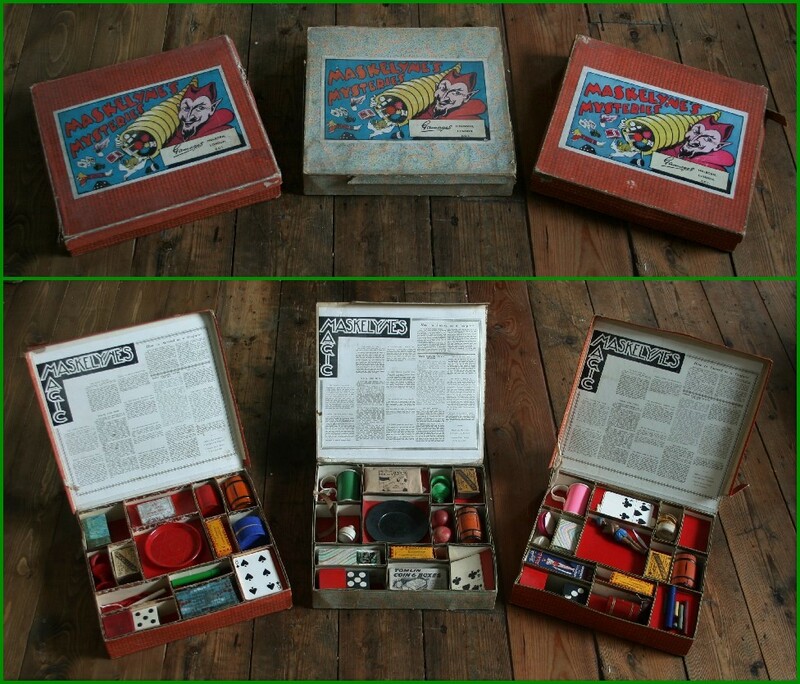 The picture above shows a double decker Maskelyne's Mysteries set. This shows the other label design used on these sets. Although only two designs of label were used they were printed in different sizes to match the different size sets. Below is a picture of this set open with its drawer out. I believe this was the largest set in the series, though I don't think there was a consistent set of sizes available over the years. Below is one of the smaller types they sold. An example of how these sizes varied can be found in this late set, shown below. I haven't seen any other examples so long and thin, sadly it's not complete. We've seen in the Gamages examples above how sometimes Maskelyne's Mysteries sets would be branded with a particular retailer, occasionally the Maskelyne name was dropped altogether and a whole label was produced for the retailer. Although these aren't strictly Maskelyne sets it's worth including them as the only way they differ is the label. This Robin's example perhaps demonstrates that the Maskelyne name was no longer the selling point it was when the Davenports purchased it in 1935. Maskelyne sets were made up until the late 1950s, possibly just into the 1960s when imported plastic sets started to displace more expensive hand made sets. Maskelyne is still a familiar name among magicians, but no longer with the general public. These sets do show an interesting period where the name was still synonymous with magic despite the Maskelyne family's performances dropping away. Eric P. Wilson and His Snowman.